What's the Correlation Between Income and Net Worth in America? Today we set out to figure out the correlation between income and net worth in the United States. One of the arguments we’ve made in the past on Don’t Quit Your Day Job… is that, well, wealth and income are not the same (even though we tax income and are uncomfortable with our wealth distributions). While argumentatively it makes sense that there would be some correlation between income and net worth – without massive luck in the form of a lottery win, unplanned inheritance, or a huge stock gain it’s impossible to hit $10,000,000 in wealth on minimum wage – there is a lot of grey area in the middle where things don’t follow a convenient equation. These grey areas contain a lot of exceptions – the aforementioned unplanned inheritances, personal finance bloggers spending under $25,000 a year (is this a big demographic? ), 20-something year old investment bankers and young doctors with student loans, pro athletes, musicians, actors, early employees at tech companies, lottery winners, and all manner of other non-traditional earners and savers. And hanging above it all is age – not only do the youth have less years of savings, home appreciation and compounding (and, recently, fewer years of student loan paydowns…), conflating wealth and income also ignores a huge number of retirees of all wealth levels with negligible income. There’s a lot going on here, so let me try to break it down. On the x-axis, you’ve got household incomes, as defined in the SCF (think ‘taxpayer units’). On the left axis, you’ve got a measure of wealth (see the SCF methodology for details). The color of the dot represents the age of the ‘head of household’, where darker dots represent households headed by younger folks. The ‘size’ of the dots is the number of households which are supposed to be represented by the sample, so even though there appears to be a large number of dots in the upper right… they don’t mean as much as the lower left dots do. Unfortunately, our goto curve fitting site ZunZun is down – but I think the picture itself conveys the information pretty well. All numbers calculated from 2013 Survey of Consumer Finances microdata. We took the lazy option again, and dumped all 5 imputed data sets into one. The graph above is all five of those data sets in one. Read the take on this (excellent, since we used it successfully) Github Repo for R users here. For informational purposes, again, we’re happy with the results. We aren’t in college anymore – but if you want to give us some grad students, we’ve got a large checklist of things we’d like to try! Now, (recognizing we’re abusing linear regressions) from the strict viewpoint on correlations, an R^2 of .33 isn’t too significant to begin with. However, it is positive, so, yes, people with higher incomes do tend to have higher net worths. But before assuming that “high incomes cause high net worths” or similar, note that we don’t know for certain from this alone that there is a connection (although we can theorize reasons why that could be the case – #1 being that generally the affluent save more), nor can we say with absolute certainty which direction that connection might point. However, it’s likely that there is a connection (correlation isn’t causation, but it doesn’t DISPROVE causation). If the relationship isn’t income causing higher net worth, perhaps traits which allow people to earn higher incomes also allow them to amass higher net worths… motivation, intelligence, choice of major/specialization/profession, social skills, penchant for saving, health, etc. General confidence – even when not negotiating, more financial confidence may lead to more raises, opportunities, etc. Ease of movement – more wealth means easier to take opportunities, interviews, etc. … and maybe some of them apply, some of the time? However, I would agree that, generally, “high income comes first”… even if the connection is a lot looser than it may appear before looking into the statistics. 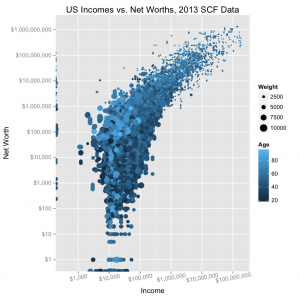 Is the correlation between income and net worth strong enough? Did you expect a stronger relationship? Should we still tax income and wealth in the same way? How do you think this data will look if we divide into ages or age groups? How awesome is my acceleration/speed income/wealth analogy? What was the t stat? 1. It’s impossible over a large sample size for low income populations to break a vertical wealth limit. All the more reason to focus on increasing income versus decreasing expenses to the point that you’re making your own laundry detergent at home. 2. There is probably a higher population of what I call HENRY (a botched acronym) – high income not yet rich – who NEVER become rich. They live day to day. Think of the stereotypical doctor/lawyer making $500k with a Porsche payment, huge mortgage, country club memberships, etc. and $50k in investable assets. Probably enough low net worth high income density to reduce R^2. I actually like the HENRY term too – used it a few times here to describe that ‘heavily taxed, but possibly negative net worth’ crew. T-stats are nice. So, if I’m inferring correctly, we could say that, with a 3 sigma(ish) level of confidence, that income explains 32.8% of wealth generation. If so, I wonder what the other 67% is. My hypothesis is hard work! 😉 Seriously, probably next is something like a ratio of income/spending. The higher that ratio, the more likely you’ll have higher net worth. They are sort of co-correlated. The number of variables in the SCF is actually pretty staggering – if you can think of some interesting questions to ask the database, let me know… just note there are only 30,000 or so datapoints, so we can shrink it pretty quickly if we aren’t careful. Where are all the negative net worths? So how about this: Break it into two groups people making below $100k and people making > $100k. 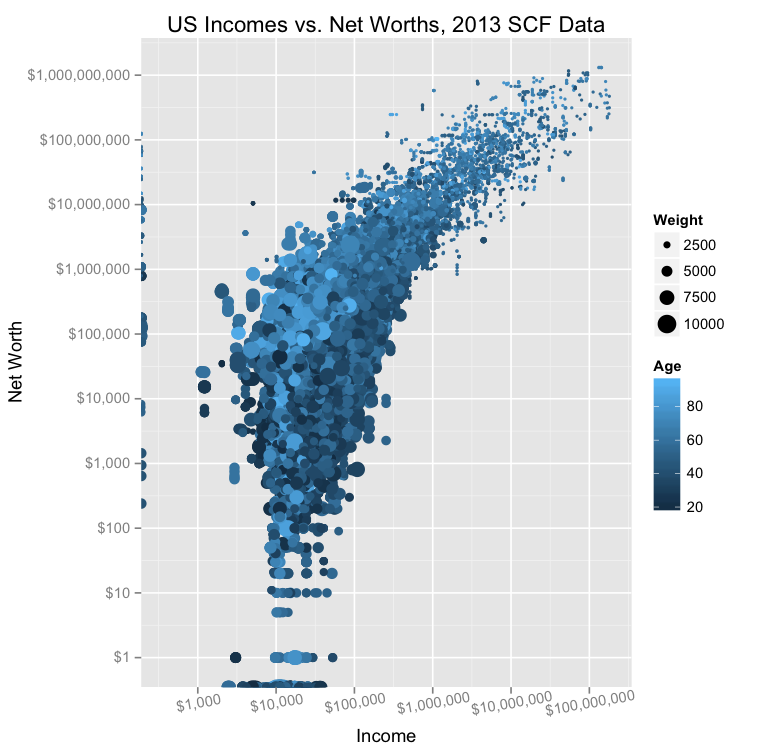 From the looks of it the very high income individuals are pretty highly correlated with wealth. Is that a correct conclusion simply looking at the chart? I mean it should make common sense, if your income is $2M then you are going to have some cash in the bank. On average what you haven’t spent yet of your last monthly paycheck will give you higher net work of most Americans. Otherwise for people making under $100k though it seems theres less correlation between income and wealth then I’d have expected. Though there are many good reasons for that. Retirees, young people who haven’t accumulated anything, wide variations in frugality vs spendthrift across all income groups, etc. Might be, but it’s tough to say – there are a hair over 30,000 samples in the set, and the bigger bubbles tend to dominate the graph. I can try dividing it into brackets (say, top 10% earners vs. 90% others or something) and seeing what that does after age groups. Like you said, the retirees are also an interesting one. Nice chart! I wholeheartedly agree, and wrote a post on focusing on building net worth more than growing income. They are intertwined, but net worth is much more important. I see so many people highlighting their incomes online. But I want to know what they have to show for their income. Completely agree; it’s just way more important, and the number of strange correlation-breakers we can name (my favorite is the low earnings but even lower spending PF blogger) means you’re not ‘locked into’ whatever income you earn. Also, I’m of the opinion online income is fleeting anyway – not ‘passive’ as some folks like to label it. It definitely has some upkeep. First thing that struck me when I saw the graph – the range of net worths at 100K!